It was a marvelous weekend. The spring weather brought everyone out of doors to wash cars, clean our garages, kids were playing basketball, riding bikes and skateboards and lots of folks were walking. Spring is just around the corner for those of us located in semi-tropical states and when the warm weather hits I get a case of spring fever that rivals twelve-grader with senioritis. I want to spring clean but mostly want to wash and hang laundry. There is nothing like the scent of bedsheets dried by the clean air, sun and breeze. Unfortunately, my small property does not have the setup anywhere for a clothesline but....but...but I now have a European Vulcano drying rack that I found at my local Goodwill a few weeks ago. Shirts, tops, pants and even undies have been washed and hung out to dry. Everything smells so good from the fresh air, tomorrow, I will do sheets. Saturday, I did a quick run to a favorite haunt and found a few nifty pieces. I can't resist antique chairs, especially if they are priced right. This pair of hand carved walnut, Eastlake Victorian parlor chairs can use a good upholstery makeover and it will be worth it as the price was too good to not take advantage of this lovely pair. The first layer of fabric (did I say first layer?) is a 1940s design. When I pulled it back, it was covering up a 1900's faux tapestry behind it. Faded and dry, I pulled back the second layer and came upon the original Burgundy velvet and damask seating. Even dryer than the layer on top of it, this will have to be removed and replaced with new upholstery fabric. I'll be looking at different fabrics to reupholster both chairs and I will be keeping these Victorian beauties. When I lived in Illinois, I had a huge, farm kitchen and used lots of vintage jars for dried noodles. flour, teas, etc. They always looked great in my pantry. I'm downsizing again, so these will all be in my main booth next weekend. Darling, early Depression grill plate. What a fun plate to serve a child's lunch on. This was a goodwill find. I adore these Whiting and Davis mesh bags, especially the fine mail like this one. It is in very good condition with the original lining intact. Some minor chain mail issues at the hinges, but nothing that detracts from this pretty bag. One of my favorite find this weekend. A Victorian cast metal thermometer with hand painted RC numbers on milk glass and the mercury bulb still intact and working. Set of four Wallace silverplate from the mid 1880s. Do you use antique silverplate? I do. I so love wondering what meals these were used with. Hubba Hubba, how fun is this Kwik Way mixer. Retro cool art deco handle and design and this baby still works. Lovely set of three, Elegant Depression saucers are etched with ribbon and posies. These are fun to display handmade soaps, pretty jewelry or a favorite pastry. Finally, a weekend that was snow and ice free. Had cabin fever big time and couldn't wait to make a road trip to my favorite haunts. It was bitter cold on Saturday, but the sky was clear and the sun was out so I was a happy seawitch. First stop was in Chamblee and although I didn't find a lot of items, I did hit the Early American Pressed Glass (EAPG) lottery. As most of you know I adore EAPG glass for its many patterns and look, but mostly because it was made only in America, has been around since the Civil War era and was the decorative glass of the middle class. It is the compotes and serving pieces that I collect and I acquired three great pieces to add to my personal collection. Lovely square, footed compote is a nice size with a pretty pattern. Another large compote has a short pedestal but has a wide and deep bowl area. Pretty diamond shapes make this sparkle. And now a crown jewel, very--very deep and high EAPG butter or cheese keeper top. Now I'm on the hunt for the matching bottom. Nice double, iron shoe last. A child's size and a lady's size allow double duty for the cobbler to repair soles. Fell in love with this find, hand scribed music. Not sure when I will put these in my booth, right now I am enjoying their beauty. This nifty, vintage McCoy wall pocket turned out to be a sleeper find. I love the retro kitcheness of it and was thrilled to learn it is a highly sought after piece for wall pocket and McCoy Pottery collectors. So this went straight into my display case in my main booth at the Buford Queen of Hearts. From Chamblee, I then moved on to Monroe to visit Hodge Podge and Davis Street Antiques. I know it is hard to see in this picture, but check out this beauty of a Tiffany type lamp I found at Hodge Podge. Gorgeous piece with a base that looks like a tree branch with an oval Tiffany type shade. Double bulbs and pulls for single or double lighting. It is now in my Victorian booth at the Buford Queen of Hearts. Pretty little quad plate toasting cup with an orchid on it. This will be a keeper. From Hodge Podge, I moved on to Davis Street Antiques. Always nice to see the welcoming smile of James, the owner. So many booths filled with vintage treasure it's always hard not to try and bring it all home. Darling decorative pillows are made to order by this talented dealer located in Davis Street Antiques. Found this great and very large Victorian frame and had to bring it home. So many possibilities for it. Would look marvelous with a mirror behind it. Now, what is this unusual item? If you are a spinner and a knitter, you will recognize a swift at one end and a yarn winder at the other, Nice antique piece is a perfect compliment to my spinning wheels. I always love to visit Davis Street because I find such unique pieces. From here I made my last stop at Antiques at Old Town in Lilburn. Lots of talented dealers at Antiques at Old Town, and I am crazy about the pretty garden spaces. Of course, my reason for swinging by was to see my gal pal, Cheryl's new space. She has a knack for presenting her pieces like eye candy and you will want it all. Look how lovely this mannequin display is. Cheryl always has such gorgeous linens and I adore Battenburg pieces. I had to come home with this lovely piece with the monogram. Saw this great late 1920's "teddy" ladies underwear. These became popular in the 1920s as the appropriate garment for the shorter fashion dresses of the day. This was my last purchase of the day and had to begin driving back home. Was such a joy to get out and about after being house bound these last few weeks. Wishing everyone a marvelous week and blessings to you and those you love. It's been a busy, busy last three weeks for me. My "real job" has been busier then ever and the "Snowmageddon" that hit the south last week had us all in shutdown mode. On top of that I have been prepping to begin my taxes for the year, sigh. Still, it was a beautiful weekend and having weather in the 50s was terrific following the extreme cold temps we have had for the last three weeks. Spent Saturday at the auction and then a quick trip to Vintage Village to pick up some chalk paint wax. I have been wanting to take a chalk paint class from one of our local artists, Dawn Fischer, of Fragments at the Buford, Queen of Hearts. So I signed up for her one day course and last Saturday, I spent the afternoon at A Vintage Styled Life learning some great chalk paint techniques. This was a goodwill find that someone had spray painted high gloss black enamel. It was a mess but had such potential for a chalk paint piece. The beauty of chalk paint is that you don't have to prep the piece and I was anxious to see how it adhered to the glossy enamel. It painted up beautifully. I used Paris Cafe color which is a taupe shade and then mixed a dark stain into clear wax to give the entire piece an aged look. Additionally, the wax provides a protective coating which will repel water. The finished piece and I love the way it brought out the carved flowers. 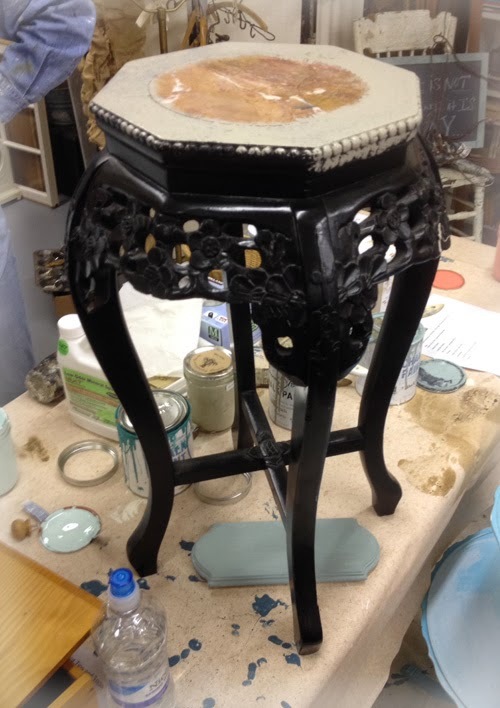 Working with chalk paint is very easy, provides great coverage and cures very quickly. If you are local and want to learn how to use chalk paint, then Dawn's course is an excellent investment in time and money. This is now in my Victorian booth at the Buford Queen of Hearts. A goodwill find, lovely bisque, porcelain Dove by Andrea Sadek, these pieces were highly popular during the 1970s. Pretty Beellek vase was another win at the local auction. Gorgeous copper scrollwork flourish is huge and another auction win. Pretty sets of mid century salt and pepper shakers. Vintage ice cream soda/malt glasses are from a midwest sweet shop. These are too cool for school. I filled these two glass pieces with faux hydrangeas and love the look. Antique chair has been painted with a brilliant turquoise. Colorful, antique sheet music has lovely illustrations on them. Pretty bone china teapot and stoneware ladies wash bowl pitcher (small in size) seem to be popular items right now. Nice selection of Washington Irving books from the 1860s. One of my favorite photographs is this dapper gentleman in his best suit with rolled cuffs. Now, for the SeaWitch score of the new year. Be still my salty heart. I had gone to Vintage Village to pick up some clear chalk paint wax and Carla, one of my gal pals and favorite dealers was restocking her booths. She couldn't wait to share that she had an unusual item that had my name on it but it wasn't my style. She knows I'm a purist when it comes to antique pieces and although I enjoy kitsch, it is not my decorating/collecting bally-wick. Couldn't wait to see what she had and boy was Carla right...it did have my name on it. Right up front and center...Seawitch. 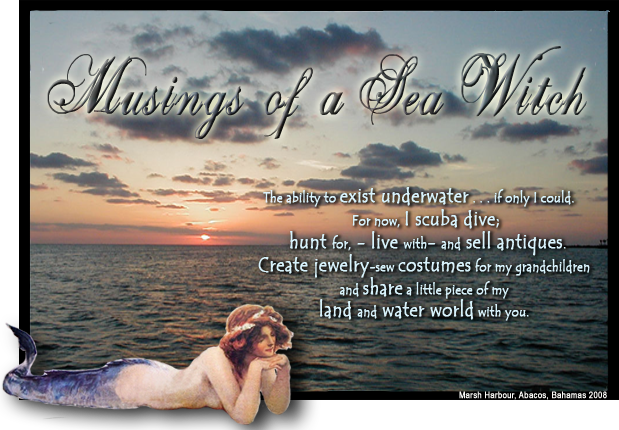 Mermaids, did I say mermaids and pinups of seawitches riding fish? As they say in pinball lingo, for me it had all of the whistles and bells that I need to bring something home. I mounted it over my bathtub and it looks fantastic there. I'm in the middle of redecorating the master bathroom which is pretty big with lots of wall space and a high ceiling. The original builder put this in and it always amuses me because my house is what is considered a first time homeowners purchase. Nothing big or really special about it and yet he installed a large bathroom. Since I am going coastal Mexico with brilliant snatches of color against cool sand walls and coffee brown chalk painted cabinets, this piece really brings color and joy into the space. This image is of what the original back looked like and I will eventually have it framed in a simple setup with brilliant ocean blue paint to give it a just yanked from the pin ball machine look to it. 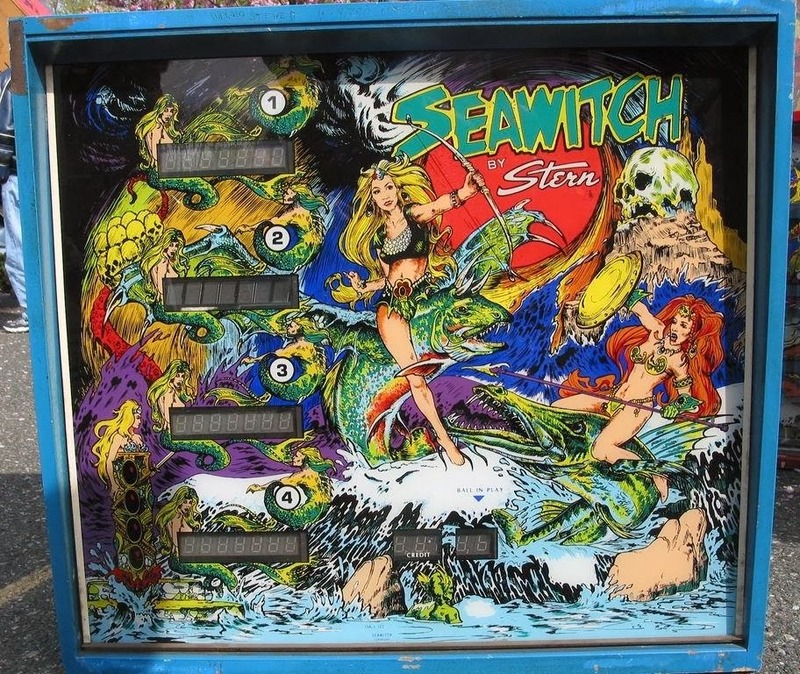 Interesting pinball machine info, the Seawitch by Stern Electronics, produced between 1977-1980, is a sought after machine by pinball collectors for its fast play, colorful lights and pinup images. Only 2,000 were made and many have been destroyed or damaged over the years. I am just delighted with this neat glass pinball backboard and so glad that Carla thought of me when she brought it in.